Rose Quartz, the “love stone,” enhances love energy in any situation by opening the heart chakra, thus bringing happiness and soothing to the heart. It enhances your capacity to love yourself and others unconditionally. It is the stone of romantic love. It protects loving relationships. 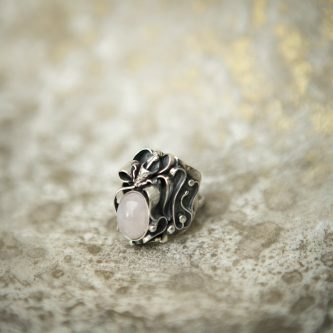 Rose quartz lowers tension and helps bring love back into parent/child relationships. It brings forgiveness, kindness, gentleness, and tolerance. It supports self-worth and your own perception of your place in the flow of life becomes more harmonious. It removes resentment, anger, blame, fear, and projections of responsibility for your emotional experiences onto others. It eases old impacted guilt and shame and heals childhood trauma of neglect and abuse. If you have difficulty thinking because of worry and emotional overwhelm, it will help your brain function and increase your intellect. Physically, Rose Quartz heals stress-caused migraine and headaches, fibromyalgia, circulatory problems, and metabolic weight issues. It is a supportive and protective stone during pregnancy and childbirth. It generates a soft glow in your energy field, which helps your etheric boundary and skin to stay supple.